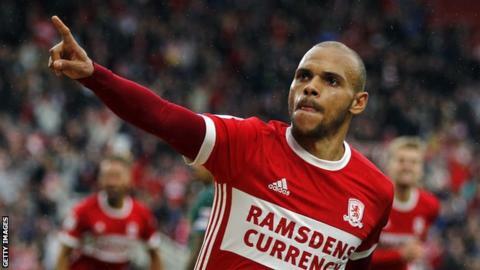 Striker Martin Braithwaite will feature in Middlesbrough’s Carabao Cup quarter-final with Burton Albion on Tuesday. Braithwaite was left out of the Boro squad for Saturday’s defeat by QPR and has been linked with a move away. Liam Boyce (thigh), Scott Fraser (groin) and David Templeton (shoulder) are all doubts for Burton after picking up injuries at the weekend. Kyle McFadzean, who missed the defeat by Fleetwood on Saturday, is also a doubt with a hip injury. Burton had never previously gone past the third round in the League Cup in their nine years in the competition since becoming a Football League club. “I still can’t quite believe Burton Albion are in the last eight of a major cup competition,” manager Nigel Clough told BBC Radio Derby. “We haven’t had too much opportunity to create history. The draw could have been kinder. It is a tough one but it is winnable. Middlesbrough won their only previous League Cup meeting with Burton, coming from behind to win 2-1 in extra time in August 2015 thanks to two Cristhian Stuani goals. Burton’s only previous away game against Middlesbrough ended in a 2-0 defeat, in a Championship match in August 2017. Middlesbrough have progressed from seven of their past eight League Cup matches against sides from a lower division, losing only against Fulham as a Premier League side in August 2016. Burton have beaten higher-ranked opposition in three of their four League Cup ties this season, beating the Championship’s Aston Villa and Nottingham Forest in rounds two and four respectively, and Premier League Burnley in round three.